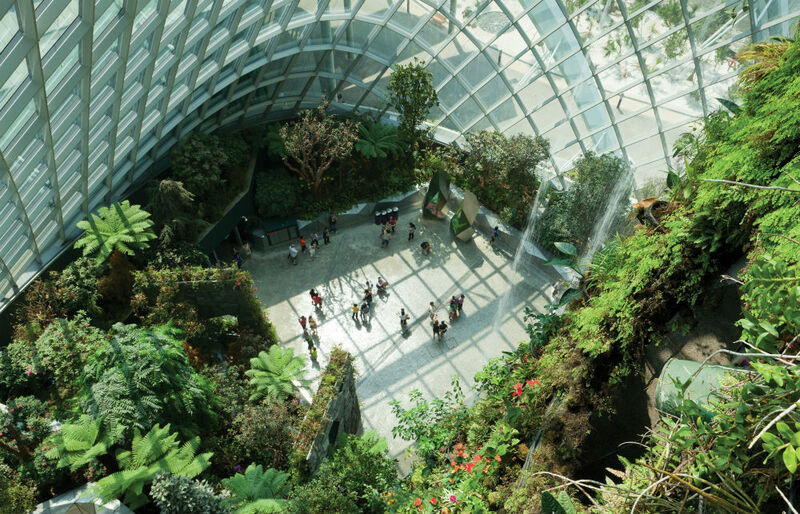 In Singapore, this cooled conservatory contains more than a quarter of a million plants from every continent except Antarctica. 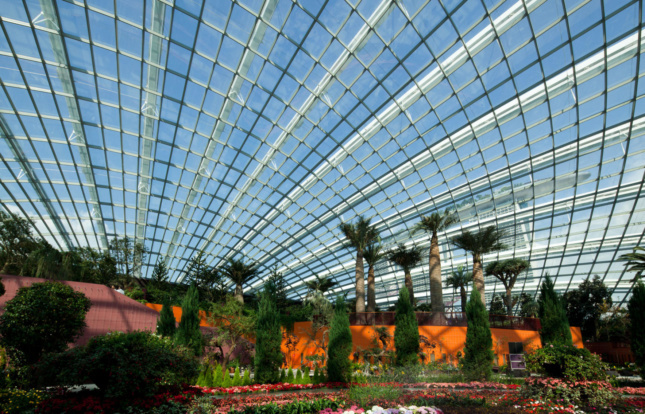 Designed by British firm Wilkinson Eyre, the project known as “Gardens by the Bay” houses a 1.2 hectare “Flower Dome” that emulates the cool/dry climate found in the Mediterranean and a 0.8-hectare “cloud forest” that recreates cool/moist climates synonymous with tropical montane regions. The owner’s technical representative, climate engineering firm Transsolar, produced a proof of concept with small demonstration greenhouses to aid the project. Adrian Turcato of Transsolar, was on hand to elaborate further. “Plants thrive outside,” said Turcato. 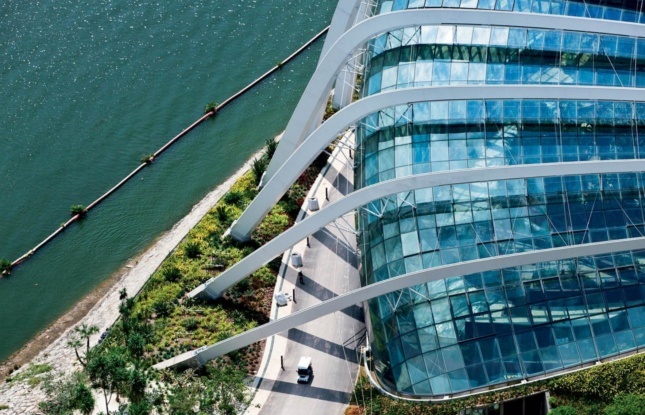 “Successfully including plants into buildings requires a deliberate design of a facade system that allows [plants] to thrive without compromising human comfort or operating costs,” said Adrian Turcato, speaking to The Architect’s Newspaper. Turcato added that “balancing plant requirements for light with human comfort by a direct manipulation of facade thermal and solar control” was also a key goal when developing the proof of concept. 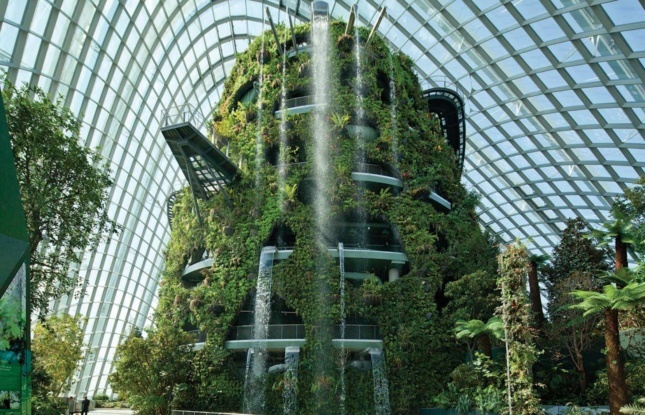 In 2012 the cooled conservatories were named World Building of the Year and in 2013 the project won the RIBA Lubetkin Prize. Turcato will be speaking at the next Facades+ conference in New York April 6 and 7. There he, Krista Palen (also of Transsolar), and Vishwadeep Deo from facade consultants Front Inc. will be providing a workshop addressing the issues raised by Turcato and will discuss the Gardens and the Bay—a case study among many, along with more practical demonstration calculations and processes—in further detail. Seating is limited. To register, go to facadesplus.com.